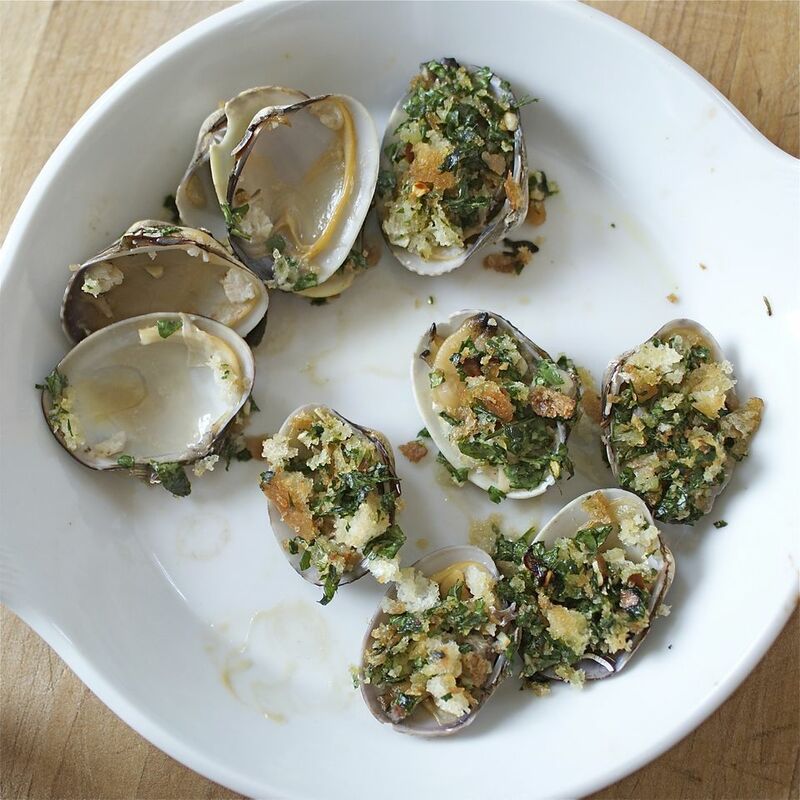 These easy baked clams have a garlicky breadcrumb topping (with a bit of chile in it if you like). They add easy and relatively affordable luxury to any feast and are especially easy if you ask your fishmonger to shuck the clams for you (if you think of it, call ahead to let them know you'd like shucked clams so they have time to shuck them for you). Once shucked, the clams should be used within a few hours. We like to serve these clams with well-chilled champagne or dry white wine, but serving them with a cold beer would be equally good. Preheat an oven to 400 F. If you haven't had the clams shucked, shuck them yourself: insert a blunt knife or screwdriver into the hinge or otherwise between the shells, twist it to break open the shells, remove the top shell, and repeat with remaining clams. Set the shucked clams on the half-shell (be sure to scrape off any clam meat that clings to the other side of the shell into the side you're cooking—you want all that meat!) on a baking sheet or in a baking dish. Peel the garlic and mince it until it forms almost a paste. Mince the parsley leaves as well. In a small bowl, combine the bread crumbs, garlic, and chile flakes. Mix to combine thoroughly. Drizzle the mixture with the olive oil and combine again. Distribute the stuffing evenly on the clams. Bake until the clams are heated through and the breadcrumb topping is browned, 10 to 12 minutes—10 for slightly softer clams, 12 for those who like their cooked seafood really cooked. Serve the clams right away. If you happen to have a lemon kicking around, cut it into wedges and let people spritz a bit of lemon juice on their clams, if they like. Other may want to add a dash of Tabasco or other hot sauce.